Deb's Cup of Tea: Of COURSE It Would Happen While I Was Gone! 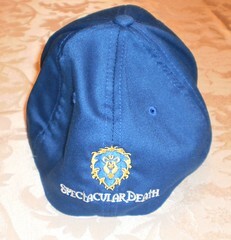 You all know I play World of Warcraft and run a guild named Spectacular Death. The online blog that covers this game, WOWInsider, had a contest called "Guild of the Month". They have done this for roughly a year. I say "roughly" because it's taken a hiatus based on what has happened in the game. 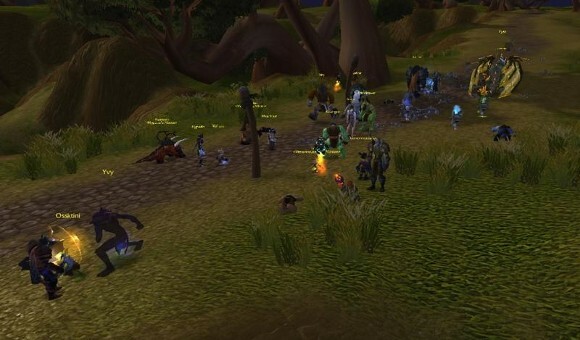 They don't run the contest when major events are taking place in the WOW universe. I have entered SD every chance possible. I'm very proud of this little semi-organized corner of the game and I love to brag about it. Spectacular Death is a finalist for March's Guild of the Month. I have a couple of questions. Are you the guild leader? And what should I call you? Congratulations, Gimmlette. 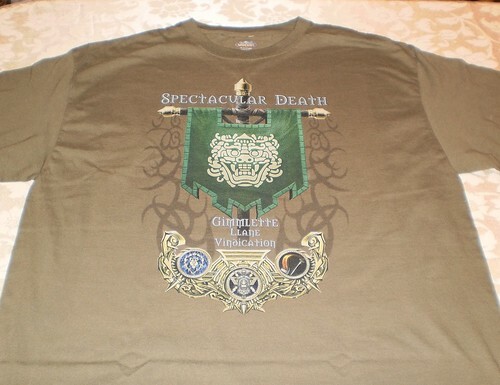 Spectacular Death is the winner of this month's guild of the month. Your events and helpful website were big factors in your selection. How did your guild begin? What kind of things are you doing now? How do you see your guild's future? To say I was thrilled is a bit of an understatement. I believe my officers got an email with "OMGOMGOMGOMGOMG" as the subject heading. I quickly responded to the questions and then sent photos over the April 2-3 weekend. We had an all-guild event planned for April 1st anyway so that was a great time to announce to the guild what had happened. "It's going to be posted 'soon'!" Yes, 'soon'. That's the operative word here. So we watched and waited...and waited...and waited. I emailed Ms. Torres April 15th and was told, "It's coming soon." April 20th, one of my officers analyzed when previous Guild of the Month posts were put up and they fell from the 9th to the 28th of the month. April 28th came and went with nothing. May arrived and we watched. I emailed on April 30th, asking if it was going to be posted soon but got no reply. They had run the contest in early April and we wondered if we might have offended them by asking how soon. There was a lot happening in the game, to be sure, and a lot more is coming, probably next month. Covering all the changes and potential changes is a daunting task and I understand those game changes are more important than a contest. But, as the days passed and nothing showed up, I began to wonder if we weren't going to be forgotten. I fully expected to not hear anything about the contest and then have it show up, fresh and new, in November with nary a mention of March or April's Guild of the Month. I got back to the hotel room last Saturday night, having spent a perfect day watching my daughter get formally married and then celebrating that marriage. I think Mom and I were lounging on the bed watching Animal Planet when my cell phone rang with a text message. It was from Totorodoo. "Insider finally posted the Guild of the Month article. Congrats." OMGOMGOMGOMGOMG! Finally. I sent text messages to everyone from the guild whose number I had. For the next 2 hours, my phone rang with messages. What a great way to end an astoundingly perfect day. Our guild portrait [above] says it all. People are wearing a wide variety of tabards which represent all the events we've participated in; achievements we've helped each other with; factions we're exalted with. We've gone everywhere and done most everything. We have every race and class. "Spectacular Death was formed on Dec. 15, 2007. My second in command, Superkind, and I were dissatisfied in our current guild. We were stalled getting into Karazhan and we really wanted to expand our view. We both wanted to see classic content but no one was interested. "What if you started a guild where the idea was we'd do the old content?" he asked me. I didn't think, if I started a guild, anyone would join. 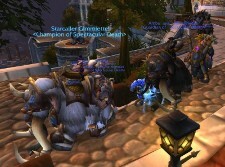 "We stood in Goldshire on the 15th, with Superkind asking for signatures and promising people a gold to sign up. As I had more money than him, it was my gold, but we got the signatures. Superkind is the only original signer who stayed. The guild name was suggested by him because I have this tendency to die in very spectacular fashion. There really isn't a way I haven't died in the game. We always celebrate those spectacular deaths because that's what you'll probably remember. Our best was a 0.03% wipe to XT-Deconstructor as we were learning Ulduar." "We've accomplished so much given that our guild is built upon the foundation of an eclectic group of casual players with different mindsets and goals and varied playtimes. While we will never be the first into content, we don't let that keep us behind and we make the most fun possible out of every event. Recently, we got Starcaller and Kingslayer within a week of each other. I am so proud of how people worked to down Algalon and Arthas. "During Wrath, we would defend the Alliance leaders against the For the Horde runs organized by Gauss, the leader of a horde guild, Three Score. We had so much fun defending we named Gauss our first honorary Guild Member of the Month. We're proud of being able to shut him and his forces down on occasion since we're not a PvP guild. "We constantly run old world content while learning and progressing through new content. We rate our success in game by how much fun we're having not by what we should be doing compared to other guilds, and we feel that is our greatest accomplishment." "We are slowly working through Cataclysm content. We've been in every raid except Blackwing Descent. Since we go everywhere and do everything, we just have to fit it all into a month and not overwhelm members with things to do. "We have to finish the guild achievements for Classic and Outland Raider. We still need to conquer Ruby Sanctum. We want to run ToGC and heroic ICC and then come back into ICC, thank Wrynn for his help, but remove his buff just to see how much harder it is. We'd also like to get Astral Walker, but that's going to require help from another guild. Some members have expressed an interest in getting T1 or T2 gear sets and there's our infamous naked Molten Core runs. "Also recently, we started an RP group; we have "Play Your Horde Nights" to get a taste of the other side of WoW; PVP nights ... I could go on. When we say we do everything, we mean it." "Our future is quite bright. There are more things to do than we have time. As we're a guild of casual players, you aren't penalized for having a real life. Sometimes, we just don't have enough people to run planned content. On those days, we find other things to do. As an example, we've been working through Naxx 25-man content with 8-11 people. The Safety Dance achievement is a lot easier to get when you only have to worry about 10 other people. Gluth, however, was a problem and we haven't gotten past him. "I want to provide an atmosphere where your schedule is not an impediment to seeing all content. If you're looking for progression, try that guild over there. If you are looking to see all content in a casual, relaxed atmosphere where there is an emphasis on fun first, you might want to check us out. We welcome all ages and server transfers. Burned out hard-core raiders might also want to look us up. 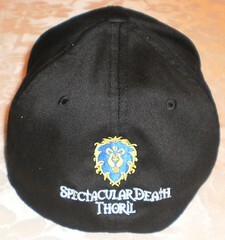 Check out our web site, www.spectaculardeath.net." Finally. Finally. Finally. There we are. We used the SwagDog gift certificate to get my second-in-command, Superkind, a hat. 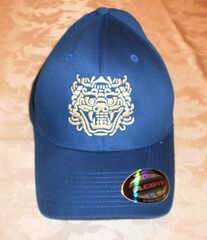 To the left is the front of the hat. I really like the color he chose. The Chinese-style dragon is our guild icon and it's done in the ivory color we have on our guild tabard. To the right is the back of the hat. He didn't put his name on it. I got a couple of tee shirts. Now, in reality, I need more tee shirts like I need bubonic plague, but I don't wear baseball-style hats and the other offerings, shirts and tees, were just not appealing to me. They were pushing a hockey-style jersey that you could get with your name across the back, but I am not a hockey fan so it just wasn't interesting. I chose to have the image you see to the left on a short sleeve tee. I have it on a long-sleeve tee so now I can wear my guild tabard in any weather. The shirt looks tan here but, in reality, it's a nice medium olive green. My other tee shirt choice was this one. 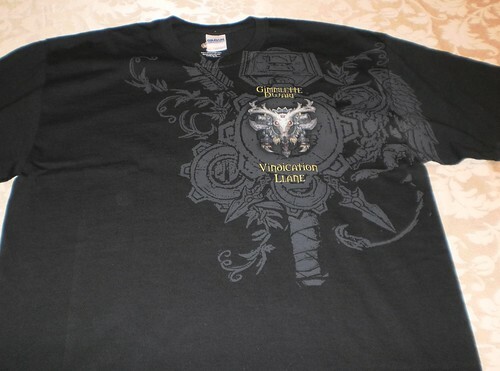 This looks very cool and is now my favorite of the 4 WOW shirts I own. Shipping and handling were also free so all this cost me was the time to figure out what I wanted. The cap and the shirts were $24.99. We still had $25 to spend. After talking with the officers, someone suggested we get Thoril a cap as a thank you for running our voice chat system until his computer died. The front. 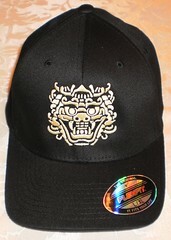 The icon really stands out as ivory on the black hat. Yes, it is the same color on both. And the back. He was very surprised but it was the least we could do for his help and giving us a free voice chat for awhile. This event topped off a wonderful day. I run the guild to be sure, but I can't do it without all the fantastic people who call Spectacular Death home. I wish I could have given each one of them something to show my appreciation for their simply being in the guild, having faith in me and what I've tried to create. And it really does seem fitting that it would be announced the week I decide to go nowhere near the game.